The late, great Divinyl's singer Chrissie Amphlett famously sang "there's a fine line between pleasure and pain". The same could be said for the space between over-enthusiasm and stupidity, the latter of which I may well have been guilty of at my last race outing. At the time of entering race three of the Sydney Duathlon Series I was a fit, healthy specimen. In the week leading up to the event I barely got out of bed after being struck down with a bout of flu. In order to convince myself that I was right to race, I tapped out a short, mediocre ride 2 days before. Even on that soft-pedaling expedition I found myself short of breath. 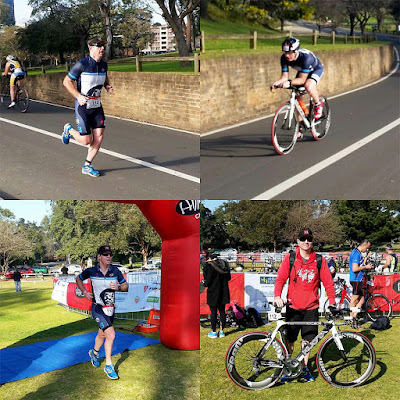 However, in my over-zealous, infinite wisdom, I decided I was ok.
Race three was at Parramatta Park on a "hot dog" style course; 3.5km run/19km bike/3.5km run. The first leg wasn't the worst, sure my breathing wasn't 100% but I at least managed around my 5km pace, completing the 3.5km in 14:07. The bike leg was far from hideous too, averaging around 33km/hr on an undulating course. Again, it could have been better but it was enough given my circumstances. I even got on the bike first go! What unfolded in the final leg was not only embarrassing but also provided a valuable lesson. Put simply, I crashed and burned with the only remnants salvaged from my smoldering fuselage being a pedestrian 15:27 run; some 1:20 slower than my effort from just half an hour earlier. It was only a few hundred metres into the leg that I realized all was not well, I was over-heating and struggling to breathe. These were usually the least of my worries off the bike when I am normally working on getting my run cadence going. The harder I tried, the slower I went. I had nothing left. If anything, it was a valuable lesson in self assessment and being realistic. Some three weeks later, I am still not 100% and I would not be surprised if this decision to race was one of the reasons for that. For now, it is back to training with my next scheduled event at this stage being the Nepean Triathlon in late October. It should be a real test for me distance-wise as it is a 1km swim/30km bike/10km run. Considering that I am yet to race a full sprint distance triathlon without the swim being cancelled, this will take me well beyond my comfort zone and I am relishing the challenge. Now it is time to set about being as prepared as I can for it.